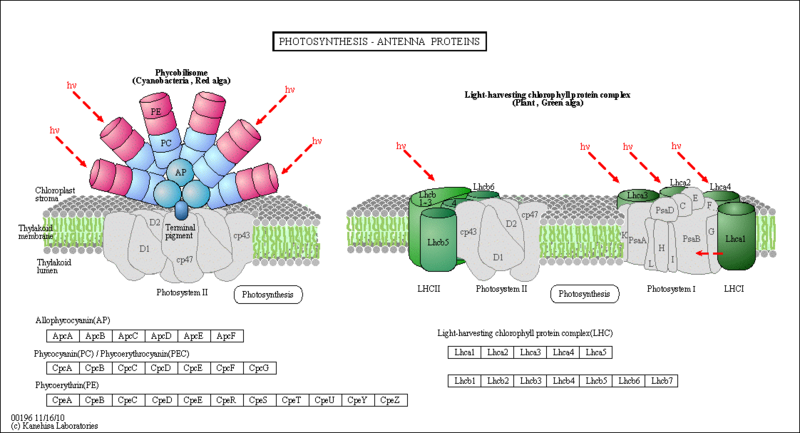 Obviously, the energy to power the light reactions comes directly from sunlight. Clue two is that plants have an organelle that animal cells don't - the chloroplast. Its structure is in many ways similar to a mitochondria in that it has internal membranes (thylacoid membranes) surrounding enclosed compartments. Plants have many pigments (chlorophyll, phycoerthryins, carotenoids, etc.) whose absorption spectra overlap that of the solar spectra. The main pigment, chlorophyll, has a protophorphryin IX ring (same as in heme groups) with Mg instead of Fe. When the chlorophyll absorbs light, the excited electrons must relax eventually to their ground state. It can do this by either radiative or nonradiative decay. In radiative decay, a photon of lower energy is emitted (after some energy has already been lost by vibrational transitions) in a process of either fluorescence or phosphorescence. In nonradiative decay, the energy of an excited electron can be transferred to another similar molecule (in this case other chlorophyll molecules) in a process which excites the energy of an electron in the second molecule to the same excited state. (It is as if a photon is released by the first excited molecule which then is absorbed by an electron in a second molecule to excite it to the same exited state, although the excitation occurs without photon production). In this fashion, energy is transferred from one chlorophyll to another. This type of energy transfer is called resonance energy transfer or exciton transfer. One type of chlorophyll has slightly different characteristics, however. Because of its unique environment, the energy level of the excited state electron is lower than in the rest of the chlorophyll molecules, in much the same way that pKa's of amino acid side chains differ with environment, and the standard reduction potential of FADs that are tightly bound to enzymes differ due to the different environment of FAD/FADH2 These unique chlorophyll centers are called reaction centers. The rest of the chlorophyll molecules act as antennas which transfer energy to the reaction centers. An electron in an adjacent excited state chlorophyll (which is at a higher level than the excited state energy of the reaction center) can then be transferred to this lower energy state level in the reaction center, in a process which forms a positively charged ion from the first excited state molecule and an anion from the recipient reaction center. This process of energy transfer is called electron transfer.